Admit it: that baby blue tile, wallpaper border and shag rug in your current bathroom are all getting very tired. It’s time for an update that can transform not just the look of your bathroom but its function as well. The best way to breathe new life into this most essential room of the house is to tackle a bathroom cabinet remodel in Corona. From Shaker white and espresso to maple glaze and cherry wood, you have a lot of options to choose from when you rely on a trusted wholesaler like Summit Cabinets. 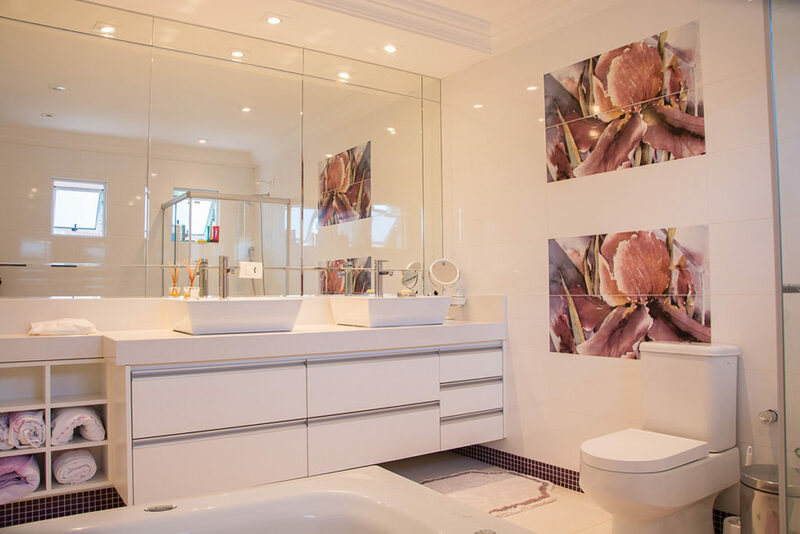 Whether you’re planning just a few updates or an entire overhaul, a bathroom remodel is one of those great projects that translates to a high ROI. We’ve put together this handy bathroom remodeling guide for your convenience. Here’s why you should undertake a remodel, benefits of a remodel, why you need one, and why it’s easier than you think. The average cost of a bathroom remodel job is $8,800, with the majority of people shelling out between $6,500 and $9,800. If you’re going to make this kind of investment, you’ll have to carefully decide which areas you’ll go big on and where you’ll cut. One area you don’t have to worry about is cabinets. When you buy wholesale RTA cabinets that are “ready to assemble,” you cut out the middleman and save a bunch of cash. Homeowners undertake bathroom remodels for many reasons. Some are planning to sell their home in the near future and want the highest asking price possible. Many buyers do like to see updated bathrooms with all the latest features and accessories, particularly when it comes to the master bath. Others just want to modernize their existing space for ease of use and increased comfort. We spend a lot of time in the bathroom, from cleaning to grooming to getting ready for the day. Updating the cabinetry, shower stall, flooring, lighting and fixtures can make it quicker and easier to go about our daily routines. Space savings: Better utilize limited space in a small bathroom with cabinets that you can customize to fit. Better organization: With new cabinets, everything will have its own place, from folded towels and hair accessories to dental hygiene items and cleaning supplies. Accents: From towel racks and new hardware to custom configurations and mirrors, you can arrange your bathroom in a way that works for you. Modernization: If you’re looking to update your bathroom and haven’t done so in decades, new cabinets are the fastest way to achieve a whole new look. Work within your space: If space isn’t an issue, transform your master bath from dull to daring with his-and-hers sinks and accompanying vanities, floor-to-ceiling cabinets, and cabinetry to hold televisions, radios, phones and other electronics. The sky is the limit! Your bathroom is a sanctuary of sorts. You use it to prepare for a busy day, and retreat to it at night to prepare for sleep. It’s the gathering spot for kids’ bubble baths, mom’s nail polish application, and teenage obsessions over eyebrows in the mirror. It’s such a major hub of activity in a household on any given day, yet so many of us are living with spaces that are too cramped and that no longer fit our needs. Your bathroom is a highly functional room, to be sure. However, it’s also one of the most critical rooms potential buyers consider when you’re selling your home. Tackling a bathroom remodeling project may strike fear into the heart of any discerning homeowner, but it doesn’t have to. A big part of such a project is your cabinets. An upgrade or facelift in this area can make all the difference. A bathroom cabinet remodel in Corona may be all you need. Need more inspiration to take that next step? Here are 10 compelling reasons why you should engage in bathroom remodeling. When you first bought your home, it was likely just you and your spouse. One bathroom was all you needed. Fast forward 10 years and you likely have a few kids, causing you to outgrow your initial space. Many homeowners choose to add an ensuite in the master bedroom, turn a closet into a half bath or add a bathroom to a floor that doesn’t already have one (think finished basement). If you don’t have the budget or the space to create an entirely new bathroom, consider enlarging and expanding an existing bathroom. You could enlarge a half bath by adding a shower or tub. Or put a tub in an existing shower. These projects will still add value to your home and give you the necessary space for comfort. If you are considered the sandwich generation—that is, older adults who are taking care of their own families and caring for an aging parent – you need a bathroom that will safely accommodate your loved one. You may have to upgrade your existing bathroom to add cabinetry down low, rails for the shower or grab bars near the toilet. Bathroom styles change as the years and decades go by. The avocado green that worked in the 70s is severely dated today. Updating your bathroom to reflect modern styles is certainly one of the more common reasons for a bathroom cabinet remodel in Corona, such as installing Shaker espresso cabinets. This could be as simple as updating the fixtures or you may want to completely tear out the existing cabinets and start over. A bathroom remodel can increase the utility and function of your bathroom, such as by adding more storage, improving the ventilation, creating a walk-in shower, adding a bidet or putting in a double sink. When you experience plumbing problems that are caused by a leak in the walls, for example, this is not an easy fix. Because of the work involved, you may just decide to do a remodel at the same time. Saving water, and therefore money on your water bill, is always a good thing. You may take this opportunity to install water-saving devices, such as low-flow shower heads and low-flow toilets. Another way to save money is on your energy bill. When you consume less energy, you spend less money. Remodeling your bathroom to be more energy efficient is smart, such as installing LED lights and more efficient ventilation fans. A bathroom remodel can certainly give your whole bathroom a facelift. Just changing out the cabinets or slapping on a new coat of paint, for example, can provide a drastic new look and feel to the space. You can do anything from replace your vanity to replace your vinyl flooring. Sometimes you just need a change. You don’t need a specific reason. You just want something new to feel luxurious and comfortable. Changing our surroundings every once in a while makes us feel good. So why not just do it? You’ll be adding to your property value, functionality, comfort and even resale value. Even a small bathroom remodel can be quite deceptive in terms of time and cost commitments. However, with proper planning, you can achieve your bathroom remodel more easily than you may have first assumed. There are many things to consider, from efficient use of space to quality materials, so we’ve got some tips to help your remodeling project go smoothly while keeping costs down. Giving your bathroom an overhaul doesn’t have to put you in the poor house. From countertops to bathroom vanities in Corona, you can do it for less! The trick is to not compromise on material while watching price tags at the same time. That starts with searching for low-cost substitutes. Sure, you want that radiant-heat granite floor but that outlay alone will blow your whole budget. Go with vinyl instead, which can easily mimic the appearance of the material you really want at a fraction of the price, says The Spruce. Luxury vinyl flooring has come a long way – it’s not the cheap alternative you’re thinking of anymore! You can even try plank vinyl for an extra classy touch. Instead of opting for high-end custom cabinetry from the expensive home improvement store down the street, go for wholesale bathroom vanities made of the highest quality materials yet with prices that fit well within your budget. For example, here at Summit Cabinets, our high-quality RTA cabinets come straight from the factory so you’re not paying for the middleman. Products are assembled on site, so again, you can save money there as well. If you have a small bathroom, there’s really not much you can do about the big three: toilet, sink and bathtub/shower. Those are fixed components that you can’t move unless you plan on blowing out a wall and expanding. Assuming you need to keep the existing space, you’ll have to shift some of the other components around. This is where RTA, or ready to assemble, cabinets and vanities come into play. These allow you to most efficiently use your designated space. Putting together your own cabinetry means you can customize how everything fits. Try doing that with standard cabinets! 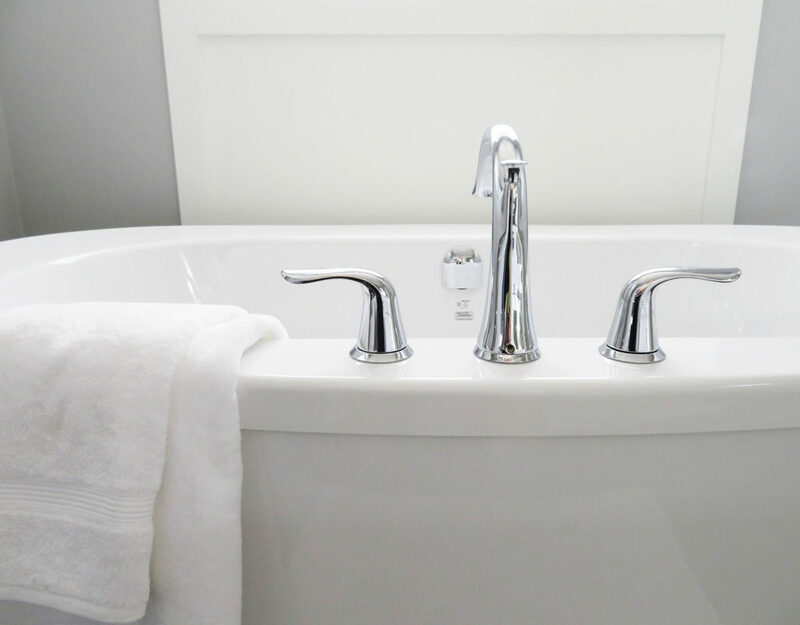 If you are getting rid of your old sink and purchasing a new one, consider installing a corner sink or pedestal for small bathrooms such as guest baths and powder rooms. Another option is to extend the counter over the toilet, as seen with this banjo-style arrangement in stone or wood slab. The extended counter gives you more space for toiletries and decorative items, yet toilet placement is unaffected, with a look that’s minimalist and clean. You could also add an optical illusion of space by stretching the mirror across the whole wall instead of just over the vanity. Not all elements of your bathroom remodel have to be big and expensive. It’s possible to make an impact in the décor and accessories you choose, too. Consider adding attention-grabbing backsplash tile, wall tile, flooring, and paint color. These are all unifying elements that can create a cohesive look for your room without spending a fortune. Plus, they’re easy to incorporate. In an all-white bathroom, add colorful trim to the shades with ribbon and fabric glue, then accent your fixtures with brass pulls and pyramid knobs. Go a little bold in your new bathroom. Use lively patterned wall paper in bright colors, perhaps on the upper half, with the bottom half and chair rail remaining white. You can get away with this in a bathroom, whereas a bold wallpaper would overwhelm a larger room. Opt for a shower/tub overlay rather than a whole new one, which involves a lot of demolition and headache. Looks just as smooth and new! If space is an issue, use a shower curtain rather than install a glass door which can bump elbows. For help with your bathroom cabinet remodel in Corona, contact us at 909-980-0700 or email us at designcenter@summit-cabinets.com. You can also check out our FAQs for more information.